Watch our video to learn what sets us apart from other companies. Why is there a dog on all of our advertising? There are a couple of reasons for incorporating a dog into our company image. First, there’s a real dog behind the idea. Black Olive, a Labrador Retriever mix, was adopted from the Blount County Animal Center by one of our employees just a few months before we moved to our location on East Broadway in Maryville. As a pup, Olive quickly became part of our team. She maintained frequent “office hours” throughout the week and napped on her favorite blue couch in our waiting area. The original Olive is now spending time at home with her family, but her spirit will never leave our business. Russell & Abbott strives to model the best attributes of man’s best friend: trustworthiness, friendliness and reliability. We come when you call and we do our best to please you. Next time you see the dog on our trucks or advertising, consider what that means to you as a customer. Then, give us a whistle—we’ll come running. Russell & Abbott is local and is employee-owned. We offer outstanding air conditioning, heating, indoor air quality and commercial HVAC systems and services. We aim to exceed your expectations from replacement evaluation to installation, repair and maintenance. At Russell & Abbott, we make sure the job is done right every time. We employ only certified and trained technicians who are not only experts within this industry, but who also take pride in their professional courtesy. We carry a CMC-C License from the State of Tennessee, which most companies do not possess. We stand firmly behind our work. New Onyx equipment installations carry an unbeatable 10-10-10 warranty: 10 years on ALL parts, 10 years on maintenance, and 10 years on labor. Our service repairs on all brands of equipment carry a 90-day warranty. Get in touch with our team today to learn more about how we can improve your household with innovative HVAC services. Russell & Abbott provides air conditioning, heating, indoor air quality and commercial HVAC services serving Maryville, Knoxville, Alcoa, Blount County, Knox County and Loudon County. 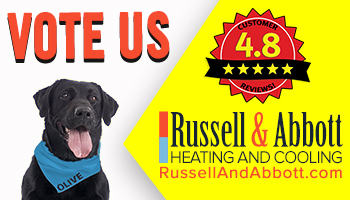 Click Here to Vote For Russell & Abbott Best - Heating & A/C Company! The key to a comfortable summer is having air conditioning. Whether you currently have a heat pump, central air unit or ductless mini split, or you need a new one installed in your new home, we can oblige you with outstanding service. We use only high quality systems for our installations and replacements so that you can count on years of reliable and efficient cooling. Moreover, our team is always at the ready to undertake any AC repair needs that may crop up from time to time, and we also offer a great routine maintenance program. During the summer, it’s hard to believe that you might actually need additional heating in Knoxville to be comfortable. But when winter hits, you’ll be glad that you have a reliable whole house heating system, whether it’s a gas or electric furnace, heat pump or ductless mini split. We can make certain that you have everything that you need, from new heating installations to old equipment replacements. Moreover, we can also take care of any heating repair or maintenance. Let us take care of your indoor air quality issues. One of the unfortunate consequences of great energy efficiency is that your home is sealed tight against the elements, often leading to ventilation issues. This can lead to the excessive buildup of airborne contaminants and pollutants, fluctuations between extremely high and low humidity levels and other problems. Fortunately, we offer outstanding indoor air quality products and services for our customers throughout Blount, Knox and Loudon Counties. Keeping everything orderly at your place of business can be something of a challenge. With so much to think about, various important tasks can fall through the cracks quite easily. But don’t neglect your commercial HVAC system. Make sure you reach out to our professional technicians today, whether to troubleshoot a persistent cooling issue or to have a new dehumidifier installed. Let our technicians take care of your workspace so that you can get back to business. Contact Russell & Abbott today.